Welcome to Issue 85 of the independent eclectic magazine that celebrates everything we love about home and family life here in the English countryside with sewing very much at its heart. As well as the six new projects featured on the cover this month we chat to a very talented maker, enjoy pancakes, drop scones and even Singin’ Hinnies (do you know what they all have in common? ), discover a little about the weird, wonderful and sometimes rather wacky(!) world of natural dyes and continue our series “From Passion to Profit” about setting up your own crafting business. 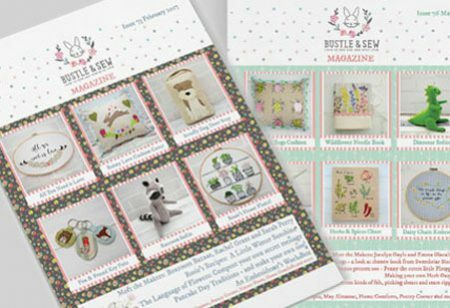 The Bustle & Sew Magazine is the work of just two women – Helen Dickson, the founder of and creative force behind the Bustle & Sew bunny and her daughter Rosie who’s a bit of a whiz in the kitchen! So if you’re expecting a glossy high-street, high-budget publication, stuffed with adverts and promotions, then this probably isn’t the magazine for you. But if you’re looking for quirky, unusual and fun sewing projects, all with Helen’s unique style, and enjoy filling your home with beautiful ideas, then you’re sure to love the Bustle & Sew Magazine. There are images of all the Bustle & Sew projects on the front of the cover so you can see at a glance what’s inside. Remember – the Bustle & Sew Magazine is an independent stitching and home magazine that carries no advertising at all – every page is full of content for you to enjoy.